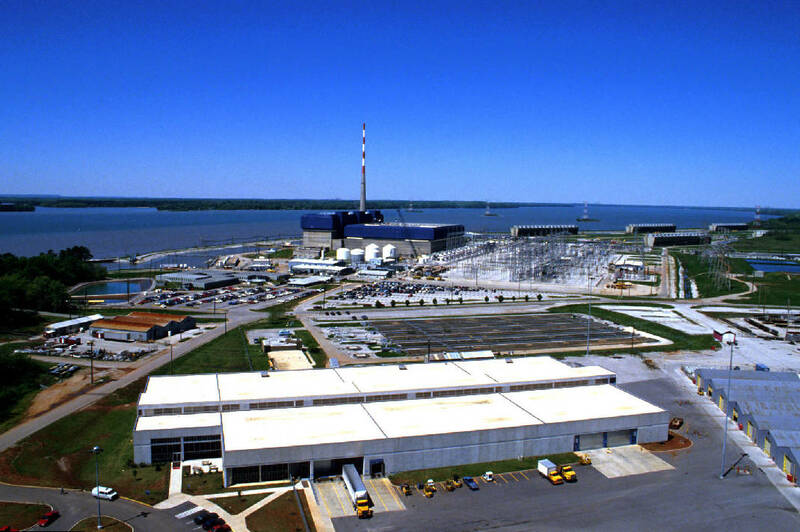 This undated file photo shows the Tennessee Valley Authority's Browns Ferry Nuclear Station near Athens, Ala.
Federal regulators have slapped a $140,000 fine on the Tennessee Valley Authority for failing to maintain adequate fire watches last year at the Browns Ferry nuclear power plant near Athens, Ala.
An NRC investigation in May 2015 found that five contract workers deliberately failed to conduct roving fire watch patrols as required under federal regulations for the nuclear plant. The fire watch patrols were required as a compensatory measure for fire protection equipment that was out of service at the time. But NRC Regional Administrator Cathy Haney said "missed fire watches greatly concern us" since fires in a plant can damage equipment and compromise safety systems. "Even though plants have other fire protection features, fire watches are an integral part of the plant's overall fire protection strategy, especially when other equipment is temporarily unavailable," Haney said. Steve Bono, site director for Browns Ferry, said today that TVA "accepts full responsibility" for the violations and will pay the $140,000 civil penalty to the NRC. Bono said the workers involved in the incident were dismissed, TVA has upgraded its fire safety training and record keeping and the utility has made major upgrades in its fire systems at Browns Ferry through the years. "In this instance, we did not meet our own standards and we have implemented corrective actions to ensure that this does not happen again," Bono said today. The Browns Ferry plant was the site of one of the worst nuclear plant fires in U.S. history in 1975 when a worker using a candle to search for air leaks accidentally set a temporary cable seal on fire. The fire spread and caused significant damage to the reactor control cabling in the plant. TVA has previously been cited for fire safety violations at Browns Ferry, but Bono said TVA has made major upgrades in its equipment, systems and training for fire safety "and in many areas we are a state-of-the-art facility" for fire safety. But fire watches are still maintained as an extra layer of protection when other safety equipment is taken out of service or when welding or other repair work is done in parts of the three-reactor plant. The NRC set the fine based on the severity of the violation and the fact that multiple contract personnel engaged in deliberate misconduct in not performing the fire watches. TVA has 30 days to pay the civil penalty or appeal its imposition, but Bono said TVA accepts the NRC findings and will pay the civil penalty.